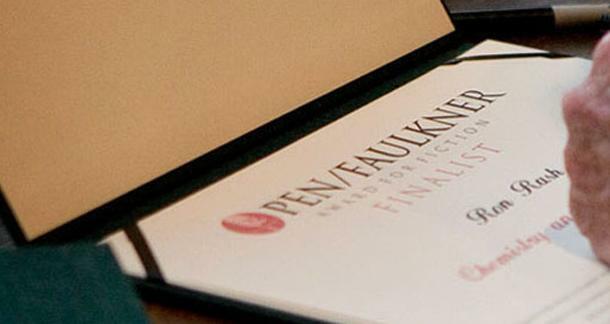 The PEN/Faulkner Award for Fiction is a very prestigious, fancy-pants award that recognizes outstanding works of fiction by American writers each year. Three judges choose five books from a pool of 300, which makes it the largest peer-juried award in the country. This year's judges were Marita Golden, Maureen Howard, and Steve Yarbrough. The winner will be announced March 26. The author taking the top spot will get $15,000, while the other finalists will get $5,000 each. Plus bragging rights, since this is a pretty big deal. You know the drill, folks: Head to the comments section and discuss the relative merits of these books versus the larger landscape of American literature this past year. I'm rooting for Russell Banks. I've only read the Delillo book (my review of which can be conveniently found HERE), so that is where my allegiance lies.